Stitch Fix, a controversial online fashion retailer that is disrupting the industry with its data science prowess and unique business model, has been consistently misunderstood and underestimated. By reinventing the way we shop apparel, its service appeals to a group of shoppers who enjoy a personalized and convenient experience that make them look good and feel good. Even if it may appear that Amazon is getting into its turf, Stitch Fix can still thrive by focusing on being Special. With a good long-term prospect, solid financials, and a competent long-term focused leader, Stitch Fix has significant upside potential for a long-term investor. In light of short-term uncertainties, prospective investors should seek a margin of safety by waiting for a price drop to low $20s when establishing a position. Since its November 2017 IPO, Stitch Fix (SFIX) has been one of the more volatile stocks in the market. Investors don't seem to appreciate the value offered by Stitch Fix, an unconventional fashion retail company that is trying to reinvent our shopping experience with a completely new take on the way we should shop our clothes. Is Stitch Fix a fad or is its Silicon Valley zest what we need to finally have an enjoyable apparel shopping experience? In this article, I will first look into Stitch Fix's business to see what it is offering to improve our shopping experience. I will then identify what potential opportunities Stitch Fix may have to grow its business and some of the threats it may face in the competitive fashion retail environment, and of course, from the mighty Amazon (AMZN). I will also delve into its financials to check up on its financial health and identify what potential risks that an investor should be aware of. Nothing is more important than the quality of the leadership for a still unproven business with a future of high uncertainty. I will look into Stitch Fix's management to see if the right leader is at the helm to lead the company through the challenges ahead of it. Finally, I will look at Stitch Fix's valuation and offer some thoughts on an investment plan for a long-term investor. Most of us shop clothes once in a while, offline or online, increasingly online with the proliferation of e-commerce nowadays. While some enjoy their whole experience, others may beg to differ. The latter group is what Stitch Fix is trying to help. 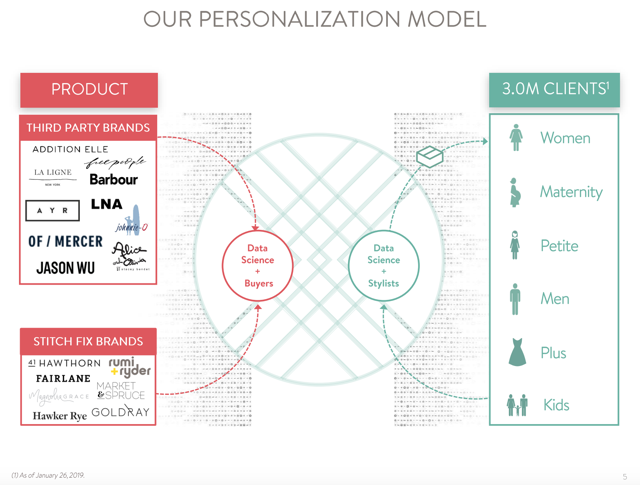 In its [10K], Stitch Fix describes its business model as "reinventing the shopping experience by delivering one-to-one personalization to [our] clients through the combination of data science and human judgment. This combination drives a better client experience and a more powerful business model than either element could deliver independently." Instead of going to a retail store or an online retailer website to pick out clothes ourselves, Stitch Fix sends us a box of clothes and/or additional accessories at the frequency of our choosing based on the style profile we fill out during the signup process. By applying the power of data science and the personal touch from a stylist, Stitch Fix is betting that we will love the clothes selected for us and enjoy our experience as a result. Stitch Fix also hopes that over time, it will learn our style tastes and preferences better and be able to make its services indispensable to us, so we keep coming back for more. 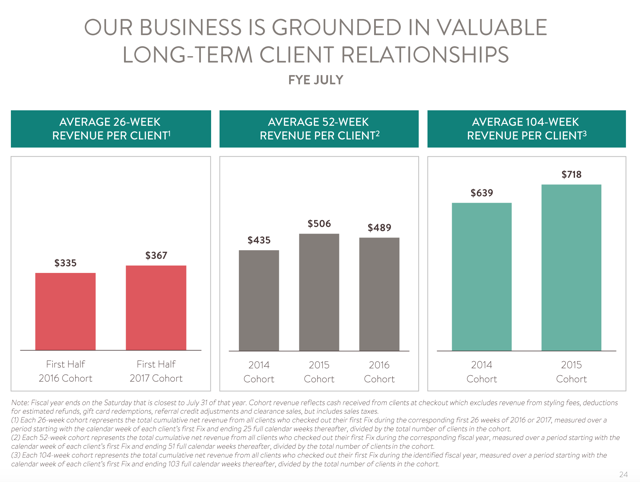 Stitch Fix noted in its 10K, "We are successful when we are able to help clients find what they love again and again, creating long-term, trusted relationships." At the heart of Stitch Fix's value proposition is an enjoyable shopping experience that is clearly distinguishable from the conventional experience mainly by two factors: personalization and convenience. By sending us personalized selections that fit our style tastes, and sometimes helping us to discover new styles that we haven't even thought of, Stitch Fix enables us to receive the high touch experience of a personal shopper conveniently in the comfort of our own homes, without breaking a sweat or being stressed out by trying to find what we want to wear, all at a fairly reasonable (though not cheap) price point. Stitch Fix started out focusing on serving women and has since "extended those capabilities into Petite, Maternity, Men’s, Plus and Kids apparel, as well as shoes and accessories." Since its founding in 2011, Stitch Fix has grown to now serve almost 3M active clients as reported just last week. Being an investor of technology companies, I am attracted to Stitch Fix not so much by its fashion retail focus, but by the opportunity to use a massive data science model to provide a deeply personalized and delightful experience (with helps from the stylists of course), and as a result, change the way we shop for clothes. As I am thinking from this angle, I begin to see the parallel between Stitch Fix and another great company that also has its value proposition centered around personalized and convenient customer experience, Netflix (NFLX). While Netflix provides a personalized content consumption experience through its streaming platform, Stitch Fix is doing a similar deed for the apparel shopping experience via its e-commerce platform, both heavily relying on big data and deep understanding of their customers' personal tastes and preferences. Granted, Stitch Fix is very different from Netflix, but I see them both as technology disruptors of their respective industries. Interesting enough, Eric Colson, Stitch Fix's chief algorithms officer, was a former VP of data science and engineering at Netflix. What a connection! Netflix was doubted every step of its journey from its humble beginning to become the streaming giant that it is today, completely altered the way we consume contents. I can see the similarity in Stitch Fix's journey so far. Can Stitch Fix follow the footsteps of Netflix to disrupt the retail industry and change the way we shop? One of the most pressing questions that I have asked since I learned about this company is how big of an opportunity this can be? The market opportunity is huge according to Stitch Fix, which touts an estimate that the online shopping market for apparel, footwear, and accessories in the U.S. alone is a $79B market in 2018 and is expected to grow to $151B by 2023, at a 14% growth rate. Adding the international markets, the opportunity will be gigantic. While this looks impressive, the real question is how many of the current retail shoppers will ditch the conventional shopping model and move over to the Stitch Fix shopping model. With $1.2B in revenue, Stitch Fix is barely 1% into its addressable market. What Stitch Fix has proven so far by attracting 3M active clients is that a portion of the population does appreciate its service and is willing to switch to this new shopping model. But we don't know what percentage of the population will ultimately convert. There are two possible scenarios here. One is Stitch Fix remains as a niche player serving a subset of the population which really appreciates the unique shopping experience it offers. The second bullish scenario is Stitch Fix successfully switches the perception of the majority of the population on its value proposition and becomes widely adopted as the natural way we shop our clothes, similar to the way that most people consider streaming as the natural way to consume contents nowadays. At this point, I believe common sense dictates that the first scenario is more likely and should be used to value the market opportunity, especially given the competitive environment (more on that later), while we continue to monitor its progress to see if the second scenario becomes more likely over time. Even if Stitch Fix can only grab 5% of market share, it is still a $7-8B revenue opportunity just in the U.S. alone. 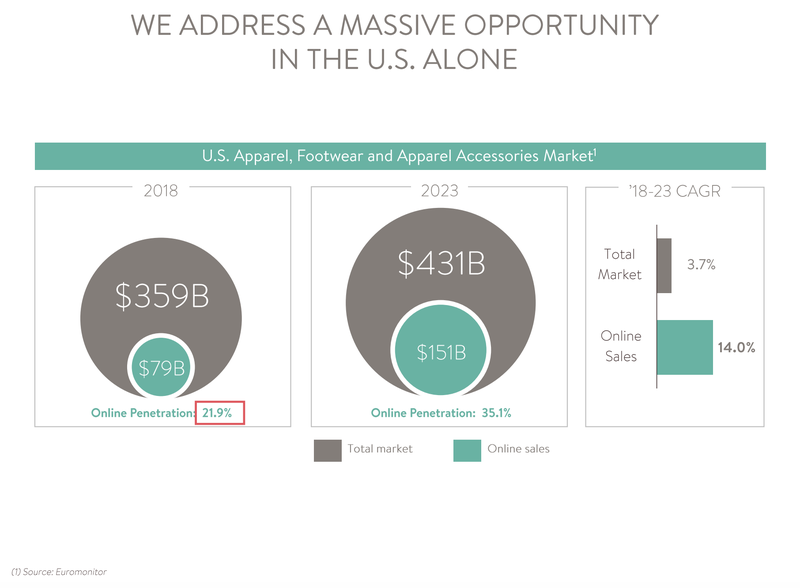 Stitch Fix president and COO Mike Smith mentioned on recent earnings call that the expanded U.S. and UK market opportunity will be over $430B. 5% of such market opportunity could represent $21.5B of revenue opportunity for Stitch Fix. This appears to be an achievable target if Stitch Fix can continue to execute the way it has been doing, giving it a long runway for growth. Stitch Fix has many ways to increase its current market share. I believe its current market expansion strategy is on the right track. Stitch Fix primarily relies on two levers to expand its market share, 1) increasing the number of clients who adopt its service and 2) encouraging more spending from its existing clients. Stitch Fix can add more clients through both geographic expansion and demographic expansion, i.e. expand to other countries and serve a more diverse set of clientele. Already, Stitch Fix has announced plan to expand to the U.K. by 4Q 2019 and it has introduced Petite, Maternity, Men’s, Plus and Kids apparel in addition to Women's apparel, its core demographic. Similarly, Stitch Fix can encourage more spending of existing clients by offering more brands, more product categories and most importantly, better recommendations that delight its customers and entice them to stay with the company longer with more repeat purchases. Not only has Stitch Fix introduced more brands (over 1000 brands) on its platform, including both established brands and emerging brands as well as its own exclusive brands, it has also begun to offer more product categories like footwear and accessories. Its Extras feature allows clients to select items such as socks, bras, underwear, and other intimates in addition to their main Fix. In a sense, Stitch Fix competes with both offline and online retailers of all sorts in order to convince customers to move their clothes shopping budget over onto its platform. Let's be honest, fashion retail is a red sea (filled with blood from the competition) that many investors may not want to be in, including yours truly. But, Stitch Fix might be an exception. Though competition is fierce, Stitch Fix sees an opening in the current market because shoppers today are underserved by both the traditional retailers and the online retailers. It believes that "many consumers view the traditional retail experience as impersonal, time-consuming and inconvenient." As for online retailers, with their focus on mass selections, low price and fast delivery, they have "further depersonalized the shopping experience." While their transaction-focused model works well for commoditized products, it falls short for style-based trendy products, and when consumers seek a more personalized experience. Stitch Fix believes the next wave of e-commerce will be about personalization and convenience, and that its intelligent combination of data science and human judgment can deliver a special personalized retail experience that consumers seek and its competitors couldn't match. In the age of e-commerce, Stitch Fix's biggest competitor is the mighty Amazon (AMZN), which began to offer Amazon Wardrobe to all its Prime members in 2018. Should Stitch Fix be afraid? Yes, but not quite. In my observation, Stitch Fix and Amazon Wardrobe are targeting two different types of shoppers by offering two totally different experiences. On Amazon.com, shoppers search, filter, sort and select through seemingly limitless product options, which could be a blessing, if you enjoy endless browsing, or a curse as it could easily turn into a waste of time or a cause of indecision. With Stitch Fix, after filling out the initial style profile and setting a delivery schedule, the shopping is done. All the shoppers need to do is wait for the box to come and to be delighted with nice surprises. So, with Amazon, you do all the work. With Stitch Fix, you sit back and wait with eager anticipation. These two distinct experiences attract two different types of shoppers. People who enjoy browsing and picking their selections and care more about price and fast delivery will likely not find Stitch Fix's value proposition attractive. They will likely be drawn to Amazon's model instead. This group will also likely represent a large portion of the population. Stitch Fix's offering appeals to people who are fashion conscious (want to look good and appropriate), yet feeling fashion challenged, and who hate shopping because they are simply too busy to browse through the myriad of selections online. They are typically less price-conscious and value personalized services. This group of shoppers will appreciate Stitch Fix's personalized and delightful shopping experience because it makes them look good and feel good without making a lot of efforts. The mighty Amazon is a powerful opponent. If it is in your territory, the only way to survive is to become Special. Amazon excels in high volume transactions of commoditized products with dependable service at a cheap price. However, there are certain areas that this model just doesn't fit. A good example is the arts and crafts marketplace Etsy (ETSY), which was under a direct threat from Amazon (with Amazon Handmade) in 2015. Today, Etsy is a thriving vibrant marketplace of 2.1M active sellers and 39M active buyers with a healthy growth prospect because it has focused on being the place to find special and unique items for special occasions. It turns out artists and makers just don't want to list their products on Amazon and people shopping for special items just don't think of Amazon as a brand for such items. Beauty retailer Ulta Beauty (ULTA) also had a fight with Amazon and has been winning, achieving a same-store sales growth rate of over 9% and revenue growth of over 20% for the past 3 years. As its CEO Mary Dillon told Jim Cramer on CNBC, "Personalization is the next frontier of loyalty." Ulta Beauty wins because it provides a personalized experience to its customers at every customer touch point, from its over 1100 retail stores to its e-commerce website to its 31.8M member strong loyalty program. Stitch Fix can take comfort from the success of Etsy and Ulta Beauty, and fight Amazon by focusing on being Special as well. I consider Stitch Fix's unique brand and its special shopping experience one of its competitive advantages that it should continue to nurture and build upon. The better it can distinguish itself from Amazon, the better chance it has to carve out a niche market. Stitch Fix needs to be very clear on who the target customers are and tailors every part of its entire experience to appeal to this group. This leads to another competitive advantage of Stitch Fix, its data science model. It is not the clothes it sells that make Stitch Fix special, it is the deep knowledge of its customers from the huge amount of data it has collected through every customer interaction that makes Stitch Fix special. Stitch Fix's data science model is creating a virtuous cycle that will become more powerful over time, benefiting its entire business and its ecosystem. The more data it collects and analyzes, the better it is at providing personalized services to its current customers, which leads to more sales. The knowledge Stitch Fix accumulates also enables it to identify and target potential customers that will be more likely to enjoy its service, making customer acquisition more effective. Such powerful knowledge about its customers also enables Stitch Fix to optimize its operations, including better purchasing decisions, better inventory management, better warehouse operation, and better stylist efficiency, all of which are critical for Stitch Fix to expand its profit margin. Finally, such powerful customer knowledge will also help Stitch Fix to deepen its relationships with its brand partners by sharing a trove of customer and marketplace insights, and to better design its own exclusive brands to meet the newly uncovered customer needs from such data model. By focusing on being special, I believe Stitch Fix could be one of the few companies that can keep their lunches from being taken by the mighty Amazon. Stitch Fix also competes with other companies that offer box subscription. However, I believe Stitch Fix has the first mover advantage with larger operational scale and much more sophisticated data science model based on all the reviews I can see so far. As long as Stitch Fix continues its strategic and operational focus, it should be able to win the competition. A lot has been said about Stitch Fix's financial performance, so I will be brief here. As a long-term investor, I am impressed by Stitch Fix's solid balance sheet with ample cash ($276M) and no debt. Despite the thin margin of the fashion retail business, it still manages to become free-cash-flow positive with a small non-GAAP net profit. It generated $1.2B in its fiscal 2018 with non-GAAP earnings of $38M and took in $366 million in its first quarter of 2019. That is a testament to its management's financial discipline and management prowess. Stitch Fix has grown revenue at a healthy pace of 25% year over year and has the ambition to maintain a long-term growth rate of 20-25%. It also focuses on building long-term relationships with its clients, which resulted in good customer retention while customers spending more over time. According to a recent Fast Company profile, Stitch just "recorded its highest-ever rate of purchased items per Fix among female customers in its most recent earnings, indicating that all that data science and personalization is paying off." 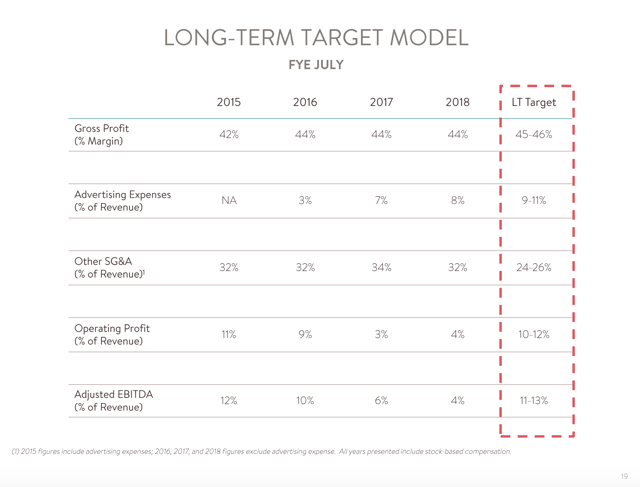 Although its margins are slim (44% gross margin% and 3% profit margin), Stitch Fix has a clear plan to achieve long-term margin expansion and to become more profitable while the company scales. As it continues to leverage its data model to help optimize every aspect of its operations, from supply chain management, inventory management, stylist efficiency, and distribution center operation, it should be able to reduce its operational expenses and achieve its long-term target of 10-12% operating margin. I think Stitch Fix has a good chance as the below example from COO Mike Smith shows. Below quote from Stitch Fix president & COO Mike Smith shows how their data model and algorithm can help optimize its operations and reduce cost. In Q2, we launched a new inventory optimization algorithm to more effectively allocate inventory across our client universe. In doing so and ensures our staff have the right inventory to meet each client's style preferences regardless of the client's position and our style in queue. Early results from this new algorithm demonstrated increases in client satisfaction, the number of items purchased for Fix and average order value. We believe this algorithm will enable us to more effectively serve our growing client base over time while also driving efficiencies across styling, inventory management and operation. In addition to the obvious competitive risk we just covered above, there are other risks and threats that Stitch Fix is facing. Fashion retail business is inherently a slim margin business, which makes profitability hard to achieve and maintain. Even with a clear plan for margin expansion as mentioned above, Stitch Fix's slim 44% gross margin doesn't give it a lot of room to maneuver. There are many factors that could drive its cost up, derailing its plan for profitability. For example, as Stitch Fix continues to scale, including expanding to other countries and adding new product categories, its operations will become more complicated and will likely be more costly to manage. It may also need to spend more than planned on marketing in order to build brand awareness and acquire more customers. This could kill its thin profit margin. Even with competent management, such operational challenges may still affect its profitability from time to time, potentially leading to more share price volatility. Because Stitch Fix service is considered consumer discretionary, a potential economic downturn could turn more consumers into price-conscious shoppers. This will negatively affect Stitch Fix's business, making it vulnerable. The good news is Stitch Fix has a strong balance sheet and should be able to scale its business accordingly with good management. The truth is nobody knows how many people will be attracted to Stitch Fix's model. Even though the company has achieved good traction with its 3M active clients, there was worry that the client growth rate has decelerated in the recent years, prompting concern that the company may have reached the limit for its customer base and growth will plateau soon. 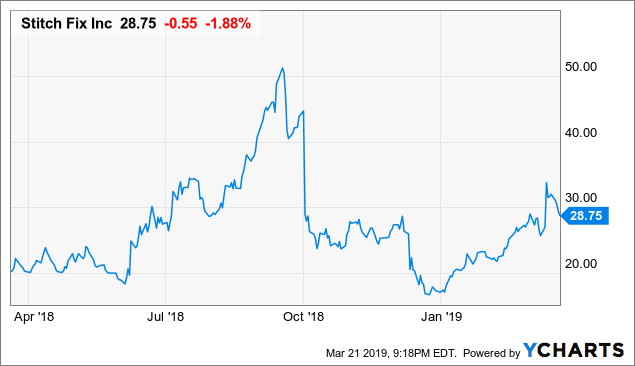 While I believe Stitch Fix is still at its early innings with a decent market opportunity as discussed in the earlier section, the risk of plateauing growth may still exist. Stitch Fix needs to continue to scale and optimize its marketing strategy to identify, locate, educate and convert more potential clients utilizing its powerful data model. To navigate through all these risks and potential threats, Stitch Fix needs a strong and competent management team to steer its operations in the right direction. A competent management team is important to every business, but it is especially important for a young business that is facing many challenges with an uncertain future. Stitch Fix is led by its founder and CEO Katrina Lake. Katrina still owns 16% of Stitch Fix, making her very vested in the long-term interest of the company. She has consistently demonstrated her focus on the long-term prospect of the company by balancing growth with profitability. Since she conceived the idea of Stitch Fix while attending Harvard MBA, she has faced doubters every step of the way. Yet, she persevered even with mounting odds against her, taking Stitch Fix to today's level. In fact, Stitch Fix went through much fewer funding rounds (raised just $43 million before going public) than many of the Silicon Valley startups because many investors doubted the business prospect of such unconventional business model. This turned out to be a blessing in disguise as it forced Katrina to be very financially disciplined to ensure the business can be self-sustainable as early as possible, thus avoiding additional funding needs. As a result of this, it has instilled in Stitch Fix's DNA operational excellence and financial discipline, making it a well-run business early on. As a long-term investor, it is important to me that the leaders of the prospective companies make decisions for the long-term benefits of their businesses and not be pressured to meet Wall Street short-term expectations. Katrina is clearly one of such leaders. Here is a quote from her on the same Fast Company profile. We did what we said we were going to do for : We committed to growth rates, revenue, and profitability, and we delivered on all of that. As a public company, there’s a lot that’s outside of your control—and to some extent the stock price is one of those things in the short term—but it’s very much in our control long term. An important part of my job is to be able to help people focus on that." Not surprisingly, Katrina Lake was ranked among the top 100 highly rated CEOs on Glassdoor. Stitch Fix also just rounded out the top 5 of Fast Company's 50 most innovative companies of 2019 for reinventing retail with all the innovative ideas the company has developed, from introducing the Style Shuffle game, which allows customers to rate a set of clothing images each day and has captured more than a billion ratings since it was launched a year ago, to its unique approach to interviewing candidates. Katrina Lake reminds me of another great female CEO, Mary Dillon of Ulta Beauty, who transformed the cosmetics retailer into a money-making machine by creating a personalized shopping experience and more than tripled its share price since she took the helm in 2013. With her tenacity and management prowess, I believe Katrina Lake can lead Stitch Fix onto a steady growth path. Investors appear to be unsure how to value Stitch Fix based on the volatility of its share price. Should it be valued as a tech company or a fashion retail company, each deserves a different multiple. In the end, I believe a company should be valued based on its growth prospect and earnings potential. 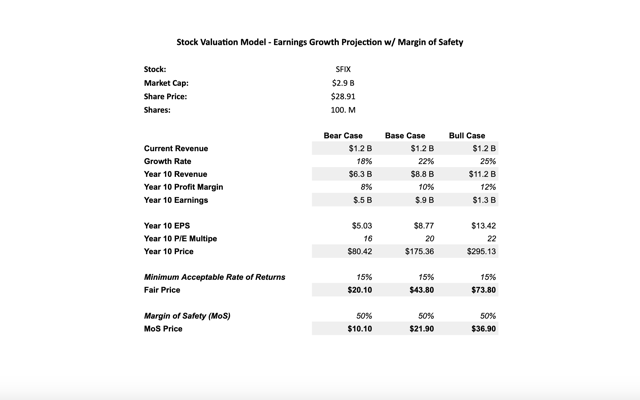 As always, I caution on making an investment decision solely based on a valuation model, which is based on assumptions (best guesses by the model creator). As an investor, especially a long-term investor like me, it is paramount that we understand the business fundamentals and the potential risks before making an investment decision that fits our own investment objectives and styles. Back to Stitch Fix's case. I believe Stitch Fix should be able to grow steadily at 20s% pace given the disciplined execution by the management. This means future revenue is still going to be under $10B in 10 years, an achievable goal for a burgeoning online retailer. I trust the management's long-term plan to achieve a profit margin of 10-12%, so I will use it in my model. As for future earnings multiple, I believe Stitch Fix can achieve close to 20 multiple if it maintains the 20s% growth rate. A quick reference is Ulta Beauty, which has a P/E of 30 (it even reached P/E 40 during its peak in 2016-2017) at a 20% growth rate. 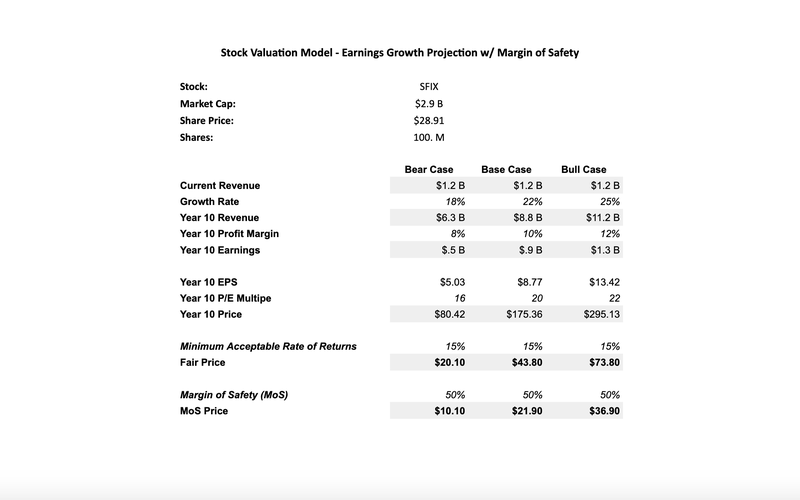 With the above assumptions, my valuation model (based on the projection of revenue growth and earnings multiple) reaches a fair price valuation of $43.80 for the base case after discounting the 15% minimum acceptable rate of returns. Adding another 50% discount for extra downside protection, the model reaches a margin-of-safety price of $21.90 for the base case ($36.90 for the bull case). Note that the fair price for the bear case is $20.10, close to the base case MoS price. The above model is for reference purpose only. I encourage you to develop your own model using your assumptions. Stitch Fix aims to "fix" our apparel shopping experience by offering a more personalized and convenient experience using a combination of the modern data science and the traditional human touch of a stylist. Will this high tech, high touch approach change the way we shop like how Netflix changes the way we consume entertainment contents? I believe it is too early to tell. The more likely scenario is Stitch Fix will appeal to a portion of our population but will likely not change how the majority shop in the near term. However, as Stitch Fix continues to make its case, it might be able to find a sizable market that appreciates what it offers and is big enough to support a viable business. The key is for it to continue to accumulate knowledge of consumer tastes, refine its personalization algorithm, and never stop finding and converting people who will appreciate such new shopping experience. When one day I hear people refer to clothes shopping as getting a Fix, I know Stitch Fix has made it. Who knows? One day this may happen, just like Netflix and Chill. Though Stitch Fix's competitive advantages (moats) look promising, they are not yet durable and need more time to fully develop. With the uncertainties on its market potential and the fierce competition from formidable competitors, Stitch Fix will have a tough road ahead until it is fully established in the market. However, even it is not going to be easy, given its healthy financials and competent management, I believe Stitch Fix will thrive in the end with a laser focus on offering a special personalized shopping experience. Investors need to set an expectation that it will grow at a measured pace by design and the market may not like it from time to time. With high near-term uncertainties, interested long-term investors should protect their downside by seeking an entry point close to the margin-of-safety price and limit their risk exposure by establishing a smaller position in accordance with their own risk tolerant levels. A patient investor who can hold it for 5 - 10 years will likely see their investment bear fruit. Disclosure: I am/we are long SFIX, ETSY, NFLX. I wrote this article myself, and it expresses my own opinions. I am not receiving compensation for it (other than from Seeking Alpha). I have no business relationship with any company whose stock is mentioned in this article.